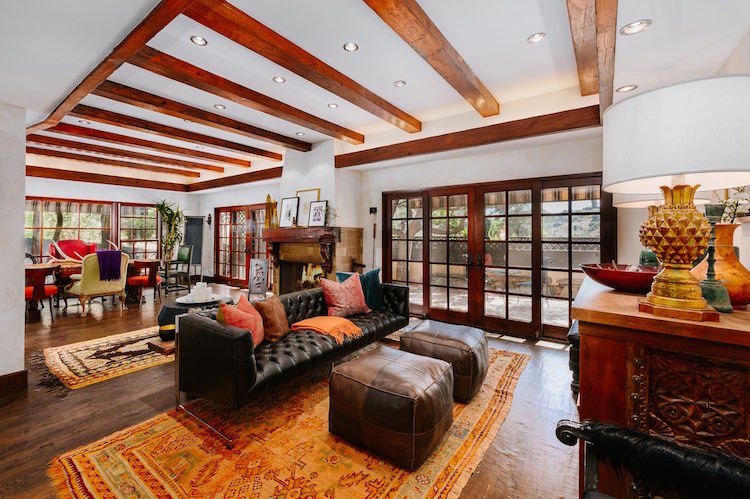 Cher recently listed her 3,000-square-foot, four-bedroom, three-bath Beverly Hills home for $2.499 million and the ultra private property tastefully blends a number of different styles. 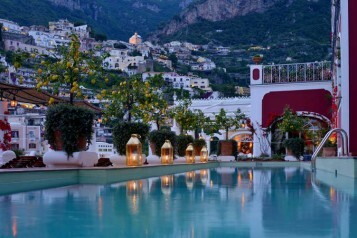 The home has an extremely private feel about it, which was no doubt a large part of the appeal to Cher, who just stole scenes in Mamma Mia! Here We Go Again (the entertainer played the mother of Meryl Streep‘s character.) 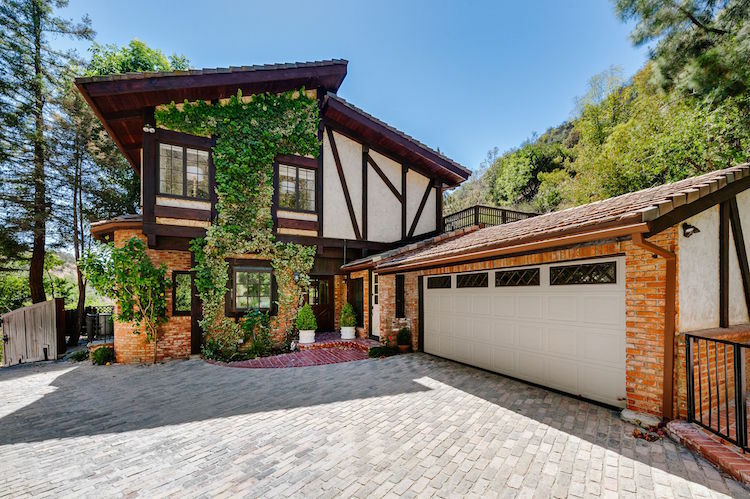 Situated at the end of a dead-end road behind iron gates on a 25,545-square-foot lot, with empty land to the back and sides of it, the home was purchased by one of Cher’s private trusts in 2013 for $2.125 million. Originally built in the 1950s, the cozy retreat boasts a romantic Tudor Revival-style exterior with timber, brick, climbing ivy and lush landscaping. 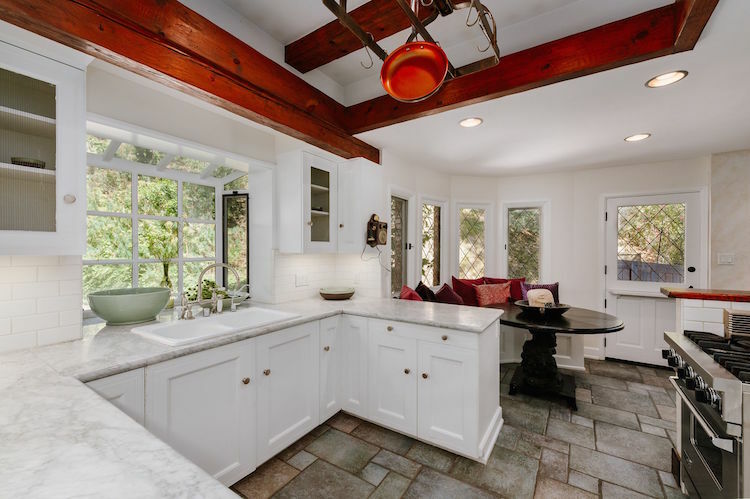 Inside, the home has been remodeled to reflect more of a country home aesthetic with an open floor plan, vaulted wood-beam ceilings and hardwood floors. 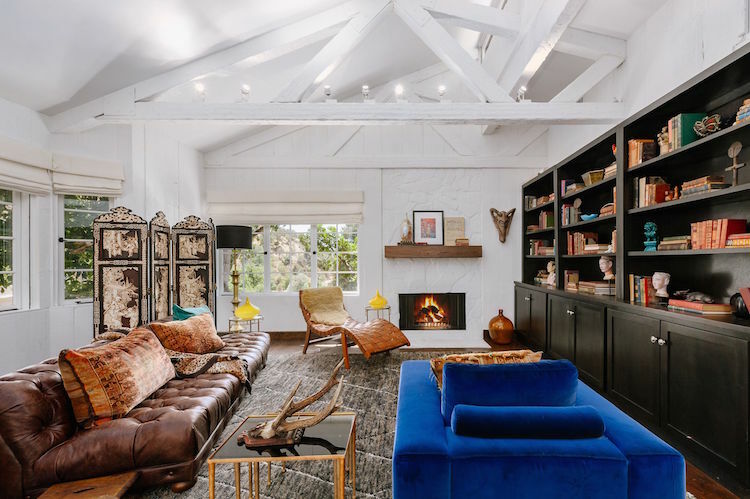 Although the Cher of more recent years may be associated with sequins and jewels, the icon’s English cottage-style home is more reminiscent of her folk-rock days, with lots of wood, leather, antlers and other eclectic decor accents throughout. The heavy dose of leather furnishings includes sofas, chaises and chairs that range from midcentury modern to western in aesthetic. Wood is another ubiquitous element, including such hand-carved items like a bedroom set, bench, chairs and numerous accent tables. 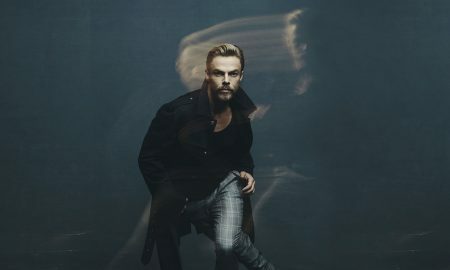 A standout piece is the dining table with room for eight, which the singer has paired with mismatched chairs, including a red leather wingback and others upholstered in green leather, an orange fabric and a cream-colored velvet. That eclecticism extends to the rest of the home, where Cher’s decor includes some more surprising elements, such as antlers, crystal obelisks, a four-paneled Chinese screen, handblown glass vases, velvet pillows, a cheetah throw, a wall-mounted copper Texas star, and rugs that borrow design elements from tribal patterns. It’s quite the mix of design elements, but perhaps appropriate for an entertainment legend who’s embraced multiple personas, cultures and sounds throughout her career. 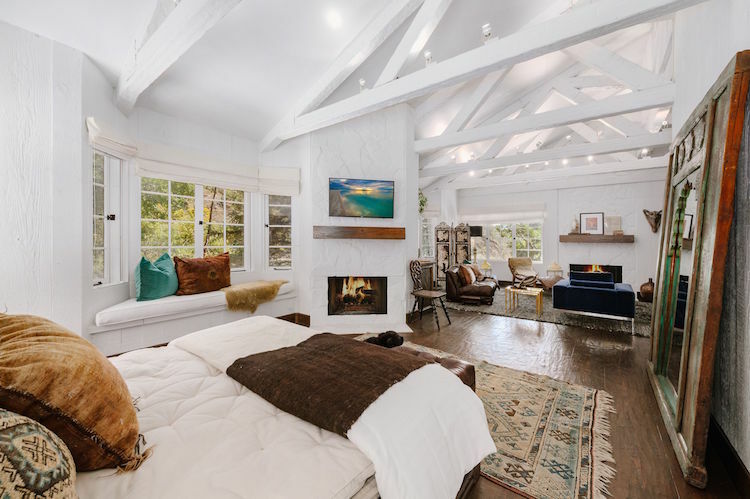 As one might expect, the master bedroom is sprawling and leaves no aspect of comfort unaddressed, including an adjacent den, a window seat, a fireplace and an enormous walk-in closet. 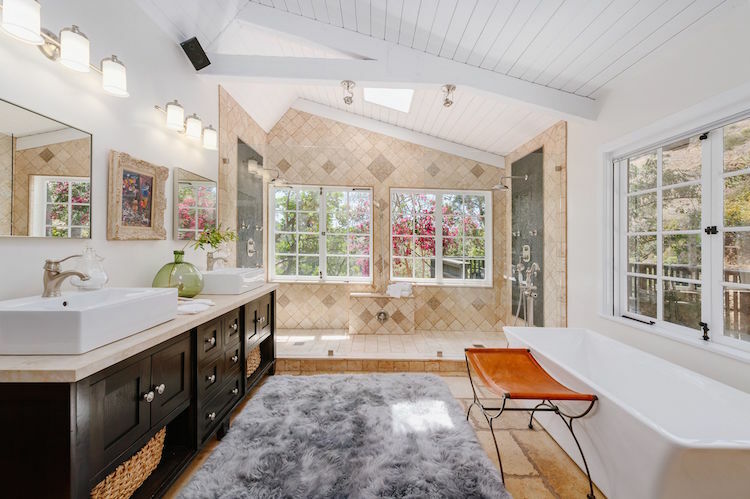 Also a retreat wholly unto itself, the master bathroom boasts gorgeous tile, a duel shower that spans the width of the room, and French doors that open to the home’s deck. The home also features an office, breakfast area, den with fireplace and two-car garage. And when Cher wanted to feel close to nature, she could take advantage of the wraparound deck with outstanding views of the surrounding mountains, as well as the property’s koi pond, waterfall and serene meditation area. The home is listed with Branden Williams and Rayni Williams of Hilton & Hyland.